Time of Origin: Earth, some time after the 22nd century. History: As villains go, Kroagnon unquestionably wins points for having one of the most unusual motives for his crimes. Known in some circles as the Great Architect, Kroagnon was responsible for such developments as Golden Dream Park, the Bridge of Perpetual Motion and Miracle City in the late 21st century. However, having created such exceptional buildings, he subsequently refused to move out, believing that allowing people to move in would result in the beauty of his work being destroyed. Although Paradise Towers, a luxury block of flats, was Kroagnon’s greatest achievement, winning several architectural awards when it was originally constructed at some point in the 21st century, Kroagnon had to be driven out before he could ‘complete’ the Towers by adding in the final necessary booby-traps to prevent anyone from actually living in them. Kroagnon’s bodiless brain was eventually trapped in the basement of Paradise Towers to ensure that he couldn’t finish his work or repeat his atrocities, but he was still able to communicate to some extent even in this form, and began to prepare for his escape (It was never revealed why nobody just killed Kroagnon in the first place, although it may have been due to a hope that they could harness his intelligence for other purposes later). The Towers themselves fell into disrepair, with various floors being controlled by ‘factions’ such as the cannibalistic ‘Rezzies’ (Residents), the Red, Blue and Yellow Kangs (Although the Yellow Kangs were all killed shortly before The Doctor’s arrival), and the Caretakers, with the sadistic Chief Caretaker in contact with Kroagnon’s intelligence - although the evidence suggests that he didn’t know who Kroagnon really was - while coordinating his attempts to ‘clean up’ Paradise Towers, taking pleasure in the deaths caused by Kroagnon’s traps even if they were his own subordinates. 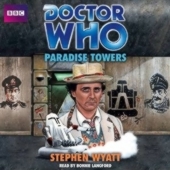 The only rogue element in the tower was Pex, the self-proclaimed ‘hero of Paradise Towers’, really a would-be soldier who had stayed behind while the rest of the able-bodied men went off to fight in an unspecified war, Pex struggling to maintain some degree of independent order in the Towers without really endangering himself. This status quo continued until the Seventh Doctor and Mel visited Paradise Towers, Mel hoping to take advantage of the hotel’s pool after the TARDIS pool had to be ejected after it sprang a leak. Running into the Red Kangs just after they had discovered the murder of the last of the Yellow Kangs, The Doctor and Mel were soon separated, The Doctor being captured by the Caretakers while Mel ran into Pex after close calls with the Kangs and the Rezzies, although The Doctor escaped the Caretakers by using their strict adherence to the rules against them after the Chief Caretaker appeared to be willing to execute The Doctor while claiming that he was the ‘Great Architect’. Reuniting with the Kangs while Mel and Pex spent some time in the pool at the top of the Towers, The Doctor discovered a video guide of the Towers in the Caretakers’ office, allowing him to identify the ‘Great Architect’ as Kroagnon, subsequently rallying the Red and Blue Kangs to work together to help him make the Towers safe. With Kroagnon having completed his research so that he could now transfer his mind into a new host, Kroagnon had the robotic Cleaners bring the Chief Caretaker to his basement ‘brain’ so that he could transfer himself into it, allowing him the chance to complete his work on the Towers. With the Caretakers having fled the Kroagnon-possessed Chief Caretaker, and even the Rezzies afraid of the scale of what they were up against, The Doctor was quickly able to organise the various factions into an effective rebellion. Contacting Kroagnon, The Doctor mocked his work on Paradise Towers, claiming that it followed Kroagnon’s usual shortcoming of failing to take people into account, provoking him into attempting to confront The Doctor directly, Pex subsequently offering to lead Kroagnon to The Doctor in exchange for being allowed to leave. Although they had attempted to turn the Red Kang’s ‘brainquarters’ into a trap using stolen dynamite, Pex’s panic caused him to lead Kroagnon to the others before it had been fully prepared, forcing Pex to sacrifice himself by throwing Kroagnon in the room and killing both of them. With Kroagnon dead, The Doctor and Mel departed, the Red and Blue Kangs making The Doctor an honorary member of both groups as thanks for his role in saving them.